Habitat preferences: Very common in and near stream channels and also found in open woods, clearings and roadsides. Plant strategy type/successional stage: Common under story species in open forests. Often found of gravel bars near rivers and streams in low elevations. 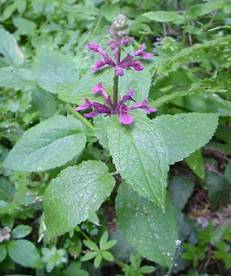 Associated species: Very closely related to Mexican hedge nettle. May be collected as: Seed, or as division. Seed germination: No seed dormancy. Germinates 15 days after sowing, with 40% success (Young, 2001). Soil or medium requirements: Peat based mix, with coarse materials and plenty of water, to simulate streamside conditions. Young, Betty. 2001. Propagation protocol for production of container Stachys ajugoides Benth. var. ajugoides plants (4 inch pot); Golden Gate National Parks, San Francisco, California. In: Native Plant Network. URL: http://www.nativeplantnetwork.org (accessed 25 May 2006). Moscow (ID): University of Idaho, College of Natural Resources, Forest Research Nursery.